The Germans are coming!! V-2 Takes to the skies! 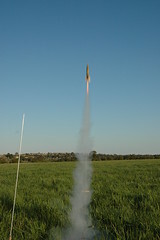 I finally had the chance to launch my ASP V-2 recently and WOW! The V-2 flys on an Estes A10-3T and it just *SCREAMS* off the pad!! A little wadding and a 7" mylar chute for recovery is perfect!